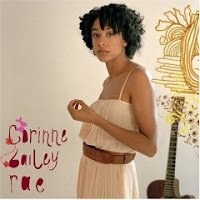 The first stop on Corinne Bailey Rae's first U.S. tour was Seattle's Crocodile Cafe. It was July 24, one of the hottest days last summer. If fact, Wikipedia has an entry on the "2006 North American heat wave." It was close to 100 that day and certainly above that in the stuffy club, which had fans, just not working ones. The water was free. It kinda tasted like chlorine, but I didn't care --- it was iced. Opening act Gran Bel Fisher looked miserable, sweat soaking through his shirt. "This is the hottest I've ever been in my life," he groaned. Corinne Bailey Rae, by contrast, just smiled after she took the stage. "It's a bit warm in here, isn't it?" she said, British accent kissing each vowel. The crowd was charmed. Reinforced by a crack backing band, the willowy singer delivered a set of soul gems, radiating youth and grace. Rae and her band made me feel the way I imagine the people who witnessed early Supremes concerts must have felt. That feeling courses through her self-titled debut. It's in the comfy, enveloping bass and the soft, clipped guitar of "Call Me When You Get This." It's in the finger cymbals on "Enchantment." It's in "Trouble Sleeping," which bobs and sways with a red-blooded horn section and has to be one of the most sensuous songs ever written about wanting to not fall in love. Most of all it's in her voice, an inviting coo with a rumple of huskiness. "I just wanted to know what it was like, what's it really like to be loved?" she sings on "Call Me When You Get This." "These little volcanoes came as a surprise to me." Sometimes love isn't as kind. Sometimes it stings, as on the wounded-heart tale "Till It Happens to You." Or it yearns for reciprocation with "my best friend" on "Breathless." Love, in all its forms, is a big part of this album. But even the sad moments will warm you up. It was slightly warm, wasn't it? Her show had to be the best $10 I spent in 2006. I'm so glad that this album made your top 10! I thought it was amazing.